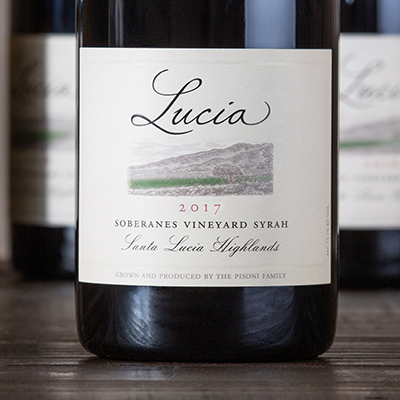 Inky purple to its essence, the 2017 Lucia Soberanes Syrah explodes with savory notes of black peppercorn, cedar, anise, and bacon. A structure of soft, elegant tannin envelops notes of clove, smoked meat, and dark berries. Added depth and complexity are attained through generous whole cluster fermentation, together with long aging in the cellar in 60- and 132-gallon French oak barrels. The cool, windy rows of the Soberanes Vineyard produce fruit with great acidity and a sturdy backbone of structure. The softer tannins will drink well now or age beautifully for over a decade in the cellar.